1) Autonomous Driving Cookbook (Preview). INFO: This repository developed and maintained by the Project Road Runner at Microsoft Garage is a collection of tutorials for developping autonomous vehicles. 2) Bill Gates at Harvard University Lab. INFO: In the above article Bill Gates discusses his visit to Harvard University laboratories. The article briefly discusses exoskeletons, soft robotics and flying microrobots. 3) ESA’s E.Deorbit debris removal mission reborn as servicing vehicle. 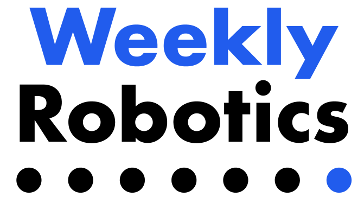 INFO: We discussed E.Deorbit mission back in Weekly Robotics #4. The project is now being reborn as a satellite service vehicle capable of refuelling, refurbrishing or rebosting satellites already in orbit. 4) Tesla Autopilot HW3 Details. INFO: You should treat this post as a speculation. Some users of teslamotors subreddit are discussing the details of possible hardware and software of the new Tesla Autopilot. The post is based on information released by Tesla, reverse engineering and speculations. 5) How To Use Docker With ROS Using DockeROS. INFO: In this 20 minutes episode of ROS Developers Podcast Christian Henkel from Fraunhofer - IPA talks about DockeROS, differences between snaps and docker images. 6) NASA To Conduct Tests of Planetary Defense Spacecraft. INFO: In the next couple of years NASA wants to send a spacecraft called DART (Double Asteroid Redirection Test) on a collision course with a non-threatening asteroid to see if it’s capable of changing the asteroid’s trajectory. 7) Publication of the week - You Only Look Once: Unified, Real-Time Object Detection (2016). INFO: You Only Look Once (YOLO) is a real-time object detection system. The object detection pipeline is a single convolutional neural network that simultaneously predicts multiple bounding boxes and class probabilities for those boxes. In the first version of YOLO described in the above paper (there have been 2 YOLO releases since the paper was published) the team achieved detection at 45 FPS on Titan X GPU and more than 150 FPS using the fast version. According to the paper one of the limitations of YOLO is that it struggles with small objects that appears in groups (flocks of birds). YOLO can also have issues with objects with unusual aspect ratios or configurations. 1) Mat’s review of 100$ LIDAR. INFO: In this blog post Mat, the editor of Weekly Robotics, reviews YDLIDAR X4, a budget LIDAR with a very good performance for the price. 1) Cobalt Robotics (San Mateo, CA, US) - Various Positions. INFO: Cobalt builds autonomous security robots that keep buildings safe by combining the reliability of machines and the friendly face of human-in-the-loop “Robot Specialists”. 2) Gecko Robotics (Pittsburgh, PA, US) - Various Positions. INFO: Gecko Robotics is automating industrial inspection and repair where existing processes are dangerous and inefficient. 3) Preffered Networks (Tokyo, Japan) - Various Positions. INFO: Preffered Networks is a startup with ~200 members based in Tokyo, focusing on developing AI for Autonomous Driving, Robotics, and Bio-Healthcare.